The head of Russia’s Liberal Democratic Party has suggested that participants in street races be sentenced to lengthy exiles to remote areas of the country, noting that life outside the capital would be the worst punishment for rich owners of fancy cars. “So they are healthy enough to go on joyrides, but they suddenly become terribly ill when it’s time to do community service to fulfill the court’s sentence? But we can amend our Criminal Code. We should introduce a new type of punishment – exile, like they had during the Tsarist period. Keep them away from Moscow for five years – for them this is the scariest outcome. Their parents wouldn’t help them when they are away,” Vladimir Zhirinovsky told reporters on Wednesday. The politician is known for his ability to make shocking proposals that cause wide public discussion, though they rarely make it into viable bills, let alone actual laws. This time, he was commenting on the latest developments in the case of group of street racers that were convicted of numerous traffic violations in late 2016. In late November, a Moscow court sentenced one of them – 23-year-old Mara Bagdasaryan – to 24 days of administrative arrest and 595 hours of community service for 11 offenses ranging from speeding to illegal parking. The court also ordered the girl to pay a total of 134,000 rubles (about $2,200) in fines. However, media reported this week that, as Bagdasaryan started her community service, her assignment was changed from street cleaning to office work in one of Moscow’s municipal enterprises. Bagdasaryan’s lawyer had told reporters earlier that she has a steel implant in a hip that she once fractured and was unfit for physical labor, especially in cold weather. The lawyer also commented on Zhirinovsky’s proposal to send street racers into exile, saying that he thought this was too harsh a punishment for such an offence, especially in a democratic country like Russia. 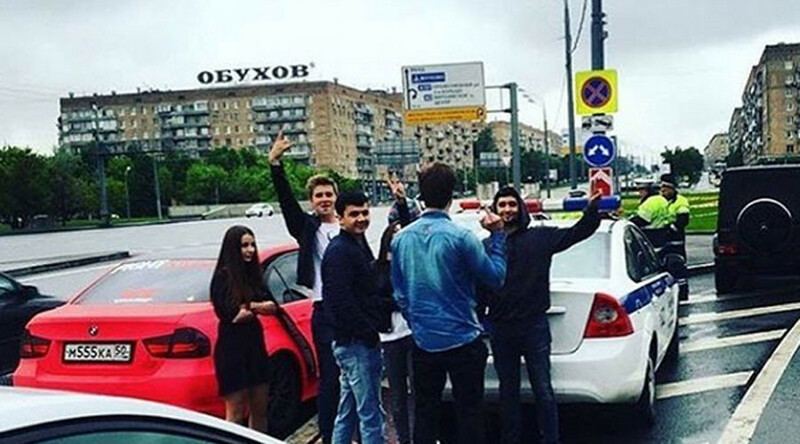 The main scandal involving Bagdasaryan erupted in May of last year, when a group of young people, whom the media later presented as the children of extremely wealthy parents, led police on a wild chase through Moscow in a Mercedes G63 while broadcasting their antics on the internet, along with their own obscene commentary. 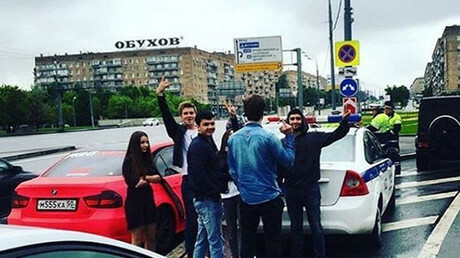 The police eventually managed to stop the car, which turned out to belong to 20-year old Ruslan Shamsuarov, the son of a vice president of Russia’s largest private oil company, Lukoil. The other participants were also young people with very rich and influential parents. The trial of the “rat pack” was thoroughly covered by Russian media and bloggers. The charges they had initially faced included threatening law enforcement officers with violence, which is a criminal offence punishable by a prison sentence. However, the court dropped the criminal charges and the suspects received only administrative sentences requiring them to pay fines and do lengthy community service. In should be noted that the Russian media reported in early January that Shamsuarov had been violating traffic laws again – this time by driving through the streets of Moscow firing a toy gun at opposing traffic.